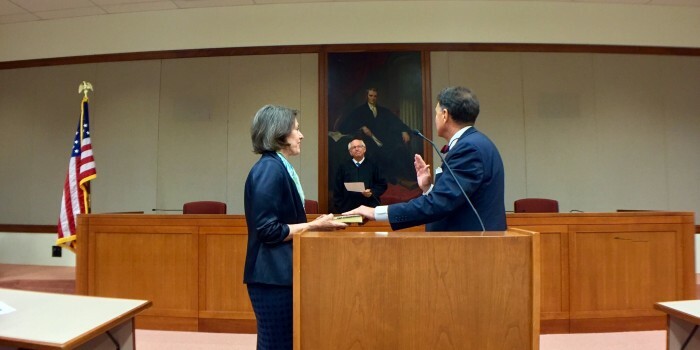 Judge Michael L. Robinson, right, takes his oath. Chief Justice James L. Gale, center, presides. Photo by Holly Swenson. Michael Lindsay Robinson was sworn in on July 1, 2016, as Special Superior Court Judge for Complex Business Cases of the newest North Carolina Business Court to be located at Wake Forest Law. Wake Forest Law sponsored the ceremony held in the Worrell Professional Center. “If the ‘I like Mike’ club was invited to come on a day when it wasn’t a Friday before a holiday and the legislature wasn’t still in session and working, I’m not exactly sure where we would have gathered together,” quipped North Carolina Business Court Chief Justice James L. Gale, who presided over the ceremony of an estimated 150 attendees. Among those attendees were members of the North Carolina Supreme Court, the North Carolina Court of Appeals, the North Carolina Fifth Division Superior Court, the Forsyth County District Court, the North Carolina Bar Association and the Forsyth County Bar Association. Judge Robinson’s children, grandchildren, friends and former colleagues at Robinson & Lawling LLP were also present. Judge Marion Warren, director of the North Carolina Administrative Office of the Courts (NCAOC) and close friend, introduced Judge Robinson. “Soon we’ll have a courthouse and a courtroom for him, and you will know that every day he takes the bench that he will reflect that which brought you here to see him receive this high honor and that this high honor will be used in the fashion that you expect in all these years you’ve known Mike,” Judge Warren added. Judge Warren was present when the agreement determining the newest court’s location would be at Wake Forest Law was signed in the General Assembly’s Legislative Building in March with Dean Suzanne Reynolds (JD ’77). The fourth North Carolina Business Court, which will be located on the third floor of the Worrell Professional Center, is expected to open January 2017. As part of Judge Robinson’s ceremony, Dean Reynolds thanked Wake Forest University President Nathan Hatch for his involvement in bringing the Business Court to Wake Forest Law and encouraged the audience to observe the courtroom’s designs in the lobby during the post-ceremony refreshments. After Judge Robinson was robed and took his oath, he delivered a gracious, light-hearted speech, revealing his cost-effective choice in a black choir robe versus a judicial one. Judge Robinson thanked a number of individuals, including North Carolina Gov. Pat McCrory, who called on Robinson to be a Business Court judge, as well as N.C. Sen. Joyce Krawiec (R-Forsyth) and Rep. Leo Daughtry (JD ’65) (R-Johnston), Chief Justice of the Supreme Court of North Carolina Mark Martin and Chief Justice Gale. As a North Carolina Business Court Special Superior Court Judge, Judge Robinson will work with cases involving complex and significant issues of corporate and commercial law in North Carolina. Cases will be designated by Chief Justice Martin. Judge Robinson will oversee all aspects of cases from the time of designation through trial or other resolution. An announcement regarding Judge Robinson’s ceremony was published by the Triad Business Journal, “Triad attorney to be sworn in as new N.C. Business Court judge,” and written by Owen Covington on June 28, 2016. For more information about the state business court, visit www.ncbusinesscourt.net, and for more information about the N.C. Judicial Branch and Unified Court System visit www.NCcourts.org. Photos of the ceremony can be found here.